Another television report in a major U.S. metropolitan area has raised the issue of alleged insurance steering, although this one focuses on overall repair quality instead of the usual parts scrutiny. The report by El Paso, Texas-based KFOX posted online Tuesday shares BMW owner Jesse Robles’ story of trying to get his car fixed after an encounter with a stray tire tread. Coincidentally, it follows another BMW owner’s recent complaint to a TV station about a preferred repairer. It also uses footage from the “Anderson Cooper 360” broadcast discussing collision repairers and insurers. Robles picked a collision repairer from a list provided by Progressive, he told KFOX, but it didn’t work out very well. He told KFOX that some parts weren’t even replaced at all with the components Progressive had bought, and the car had examples of overspray and gaps. Robles recorded a Progressive representative who said the insurer would cover redoing it because he used a preferred shop, according to the station. Then Progressive said he should take it back to the shop that’d done the work, Robles said, according to the KFOX report. “They say that it’s a quality shop. It’s not a quality shop. It’s the lowest bidders,” Robles says on the broadcast. 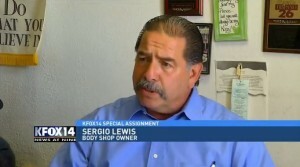 The station also interviewed local body shop owner Sergio Lewis, who described to the station the controversy in the collision repair industry over insurers’ preferred shops. Although more peace of mind would be to expect a shop to get the job done right in the first place. Statements like Progressive’s guarantee comment are also being challenged in auto body shop lawsuits against insurers in multiple states. “Despite the well-publicized advertising statements of insurers such as State Farm, GEICO, Liberty Mutual and Allstate, among others, that ‘guarantee’ their repairs for as long as the consumer owns the repaired vehicle, these companies’ own documentation disclaims this purported guarantee specifically with respect to aftermarket and salvaged parts,” Indiana Autobody Association et al v. State Farm et al states, for example. “First, no insurance company and certainly none of the named Defendants performs any repair work,” it also states. “Therefore there is nothing for them to guarantee and asserting to Plaintiffs’ customers and potential customers they will guarantee the work is both misleading and inaccurate. As phrased, Defendants’ guarantee assertions reasonably lead consumers to believe the repairs are guaranteed by the insurer, which they are not. The lawsuit also alleges that such a statement implies that non-preferred shops don’t guarantee their work — something any reputable shop does.